SALVADOR'S DECLARATION II GLOBAL FORUM ON SUSTAINABLE TOURISM - II FGTS We, 80 persons of 63 organisations from 9 countries (Germany, Australia, Brazil, Benin, Canada, Chile, South Korea, India and England), including representatives of 9 Brazilian states (Bahia, Ceará, Maranhão, Minas Gerais, Paraná, Rio Grande of the North, Rio de Janeiro, Sao Paulo and Sergipe) gathered at the School of Fine Arts of the Federal University of Bahia, in the city of Salvador, State of Bahia, Brazil, between the 14th and 15th of March 2018, we carried out the second Global Forum on Sustainable Tourism (FGTS) as a self-managed activity which has fallen under the thematic line ‘Economic Democratisation’ and presented as a part of the Solidarity Economy Work Group of the World Social Forum (FSM) 2018. 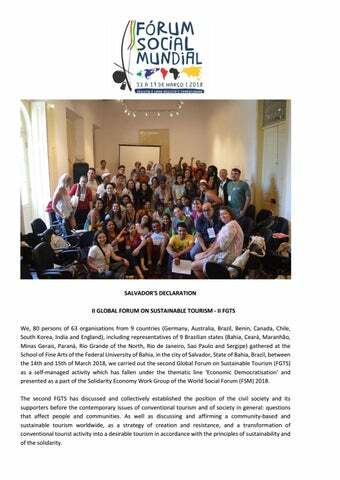 The second FGTS has discussed and collectively established the position of the civil society and its supporters before the contemporary issues of conventional tourism and of society in general: questions that affect people and communities. As well as discussing and affirming a community-based and sustainable tourism worldwide, as a strategy of creation and resistance, and a transformation of conventional tourist activity into a desirable tourism in accordance with the principles of sustainability and of the solidarity. The participants of the II FGTS reaffirm the potential of community-based tourism as a tool of sustainable local development from successful experiences led by people and communities. These exemplars are based on principles such as solidarity economy, which contest the hegemonic forms of conventional and mass tourism that often present themselves as non-sustainable: segregating, predatory and invasive against people, their environment and their cultures. We believe that we resist on a global scale, but we act in a local way. development of a stimulating relationship between community-based tourism and the solidarity economy, while promoting conscious consumption. How and when will the actions be carried out? It has been a collective decision of the group that the Brazilian Network of Solidarity and Community-based Tourism (TURISOL) can and must be strengthened by the union and the work of volunteers that are willing and able to contribute to the strengthening of another kind of tourism. In this regard, to strengthen the works within the TURISOL network in a pragmatic way, we are establishing Working Groups (WGs) formed by volunteers willing to collaborate on the following subjects (1) Public Policies and Education, (2) Communication and Marketing and (3) Network Articulation. The Public Policies and Education WG must make a formal request to the Ministry of the Tourism for the creation of a Program of Support for Solidarity and Community-based Tourism. This WG must also seek interministerial support and activate areas such as Labour, Environment and Culture, among others. The good practices that exist in States and Municipalities, as well as in other countries, should be summarised and shared to inspire other places. The WG should also discuss and encourage ways of supporting formal and non-formal education in those communities that are developing, or are willing to develop, tourism activities. 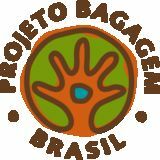 The Communication and Marketing WG will be responsible for gathering information on the initiatives of solidarity and community-based tourism in Brazil and must create partnerships for dissemination and marketing of these initiatives in the short term. In the medium term, a unified platform for dissemination will be created, as well as other strategies for expansion of visibility for the territories and identities. The actions of the Articulation WG include the organisation of face-to-face and virtual meetings to give life to the Networks and the Working Groups. This will include joint actions of the national network with the networks of Latin America and the world, as well as the revitalisation of the network through the invitation of new members. It should also promote the institutional strengthening of the TURISOL network. Other actions were also pointed out to create an immediate impact and empowerment, such as: the creation of a social media communication group for the communities with the purpose of sharing experiences and even exchanges among the initiatives; the registration of the community-based tourism initiatives on the CADSOL database (Cadastro de Empreendimentos Solidários – National Database of Solidarity Economy Enterprises); the creation of regional networks to strengthen local territories and to increase the connection of the community-based tourism initiatives with the groups and the actions of Solidarity Economy networks. Participants: ABBTUR, Agência de Turismo Comunitário Rocinha Original Tour, APTS, Apoemas, Araribá Turismo & Cultura, Associação de Moradores da Prainha do Canto Verde, Escola de Belas Artes-UFBA, Casa do Boneco de Itacaré/Quilombo Doiti, Chamman, ComuniCulturi, Coopafeba/MLT, Eco-Benin (Benin), Equations (India), Fórum de Turismo da Rocinha, Fundação Casa Grande, Fundação de Petitinga, Grupo Guarapés Paraná, Grupo de Pesquisa Gestão de Territórios Criativos - UFV, GAPIS-UFRJ, Instituto de Permacultura EcoVida São Miguel, Instituto Brasil de Estudos, Pesquisas e de Gestão Estratégica de Competências, Agência Conectando Territórios, ICMBio – Instituto Chico Mendes de Conservação da Biodiversidade, Instituto Cultural e Ambiental, Lopes Trovão - Vila do Pincel, Rosa e Sertão, IFBA, MNUCE, Imagine Peace (Coréia do Sul), MNLM, Movimento Regenera Rio Doce, ONG Rede Brasilidade Solidária, Na Chapada Turismo, Platatur Salvador, Projeto Bagagem, Projeto Tainha TBC, Projeto Mutirão Mais Cultura, Pueblo Mapuche (Chile), Raízes Desenvolvimento Sustentável, Rede Cearense de Turismo Comunitário- Tucum, ROC-Rio, Rede Caiçara de Turismo de Base Comunitária, Núcleo de Turismo Étnico Rota da Liberdade, Movimento Slow Food, SKTour-Salvador, TAAF Tourism Advocacy and Action Forum, Teia dos Povos, Toursbahia, Elisa Spampinato, Tourism Watch – Bread for the World (Alemanha), Turismo e Afins, T+M Produções, UCSAL, UFBA, UFMG, UFRN – Natal, UFRRJ, UFSB, UFMS, UNEB, UnB, Unirio, Universidade Unisa (Austrália), ViverTur de Matarandiba, Rota do Sisal/Assentamento Lagoa do Boi.